Naman is an attempt to instill in our children, age-old morals and values that have held the Hindu Society together despite all odds. 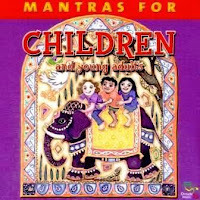 A collection of mantras specifically for children, it endeavors to lay the right foundation for the over all growth of the child. Starting from Gayatri mantra invoking the grace of the powerful sun, we go on to the other shlokas to be chanted at specific times of the day and night, addressed to the Guru, and various Gods and Goddesses who have the power to touch our lives. Rattan Mohan Sharma has an exquisite voice and the children's choir lends an innocence and purity to the recording. Also Includes a booklet with the prayers in Sanskrit and English. These mantras can be used by anyone and are easy for Westerners just beginning the practice of reciting mantras.